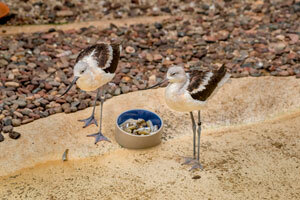 The Milwaukee County Zoo welcomes two female American avocets to the Aviary. These birds hatched June 20, 2017, and arrived from the Monterey Bay Aquarium. The American avocets are housed in the Shorebird Exhibit, along with a pair of black-necked stilts, hooded mergansers and common gallinule. The two avocets have not been named yet; watch for their names in the future as they settle into their new home at the Zoo. An assortment of foods comprise the birds’ diet, including soaked apple paradise and flamingo fare pellets, chopped hard boiled eggs, romaine lettuce, silversides and capelin. Waxworms, mealworms, crickets and pinkies are also included in their diet. Food is offered in dishes near the water to encourage natural feeding behaviors. The avocet pair has been enjoying different forms of enrichment, including the exhibit wave machine, simulated rising tide, rain and mist features, and live crickets. 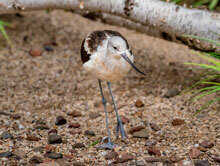 The American avocets are shorebirds with notable upward curved bills and webbed feet. They can be found in wetlands across the western portion of North America. American avocets will issue a round of call notes that change pitch in order to protect themselves from predators. Currently listed in the least concern for extinction category, growth rates for American avocets remain steady. 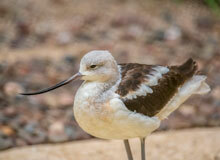 Take a break from the chilly weather, and visit the Aviary to see the American avocet pair!